Stockholm, NJ, September 15, 2017 — For the first time, a Kickstarter project has launched its own campaign. 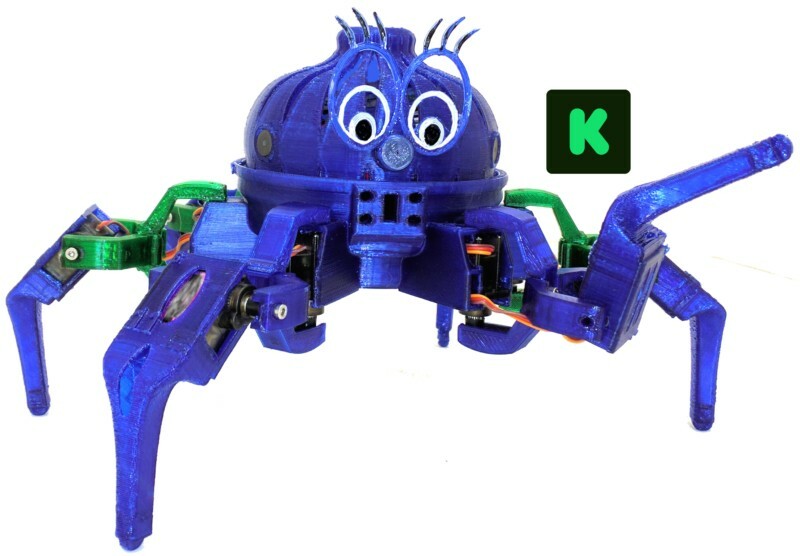 On September 12 the Vorpal Combat Hexapod—an open source, 3D printed, wireless walking robot—used one of its six robotic legs to press the “LAUNCH” button on the popular crowdfunding website, triggering its own campaign to go live to Kickstarter’s millions of backers. Although somewhat spidery looking as they scamper across a tabletop or floor, the hexapods sport whimsical eyes and other decorations, making them look more like cartoon characters than arachnids. Up to sixty different motions can be triggered by the hexapod’s custom Bluetooth gamepad, which is also 3D printed. Because of this versatility, the hexapod can be used to play games using appendages attached to its accessory port. These appendages are—you guessed it!—also 3D printed. Joust, Capture-the-Flag, Fidget Spinner Challenge, and other games are already available, with more in the pipeline. The company also provides complete kits that include all 3D printed parts, and even fully assembled hexapods for those who just want to play games and program. The Vorpal system also supports the MIT Scratch drag-and-drop programming language. Many schools already use Scratch to introduce programming to students, so this builds on a system many teachers already know. Students can even create new leg motions using Scratch and upload them to gamepad buttons for use during games and activities. Dieser Eintrag wurde veröffentlicht in Crowdfunding, English, General und verschlagwortet mit Kickstarter, Open Source Robot, Vorpal Combat Hexapod von Sebastian Trella. Permanenter Link zum Eintrag.